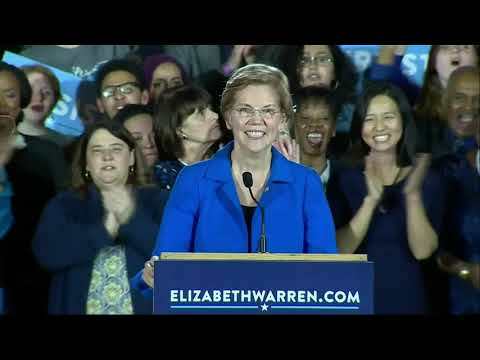 BOSTON (AP) — Democratic U.S. Sen. Elizabeth Warren, among her party’s harshest critics of President Donald Trump, won re-election Tuesday in Massachusetts and wasted little time ripping into her nemesis. Warren defeated Republican state Rep. Geoff Diehl, the Massachusetts co-chair of Trump’s 2016 campaign, and independent candidate Shiva Ayaddurai. Warren was also quick to credit women with leading the resistance to Trump. Warren has generated considerable speculation about a possible run for the White House in 2020, recently saying she’d take a “hard look” at a presidential bid after the Senate race was over. With her win, supporters and critics alike will begin looking more closely for any signs from Warren about whether she intends to launch a campaign for president. The former Harvard Law School professor recently released a DNA test suggesting that a distant ancestor was Native American, an effort to rebut Trump’s frequent mockery of her claim to Native American heritage. Diehl conceded just after 9 p.m.
Tuesday morning Warren downplayed her clashes with Trump after voting near her home in Cambridge. Warren said that Diehl would be a rubber stamp in Washington for Trump’s agenda even when it’s not in the interest of most Massachusetts residents. Diehl argued Warren spent too much time traveling around the country to stump — and raise money — for fellow Democrats running for Congress. He said she should quit and run full time for the White House. Trump taunts of “Pocahontas” directed at Warren in part prompted her decision to release the DNA test. Warren has said the decision to release the test results was also part of a wider effort on her part to be an open book. “I put it all out there. Ten years of tax returns. All my employment records, And yeah, I even took a DNA test. It’s there. It’s on the internet. Anybody can take a look at it,” she told The Associated Press in a recent interview. Although she points to some legislative successes under the Trump administration, Warren said her decision to campaign for Democrats in other states is part of a wider goal to help flip the Senate to make it easier for Democrats to push a more ambitious agenda in line with what she said are the goals of most Massachusetts voters. Asked about the worst thing Trump has done during his two years in office, Warren pointed to what she described as his embrace of authoritarian figures like Russian President Vladimir Putin or North Korea’s Kim Jong Un.